11 February, 2014. It was a Tuesday. 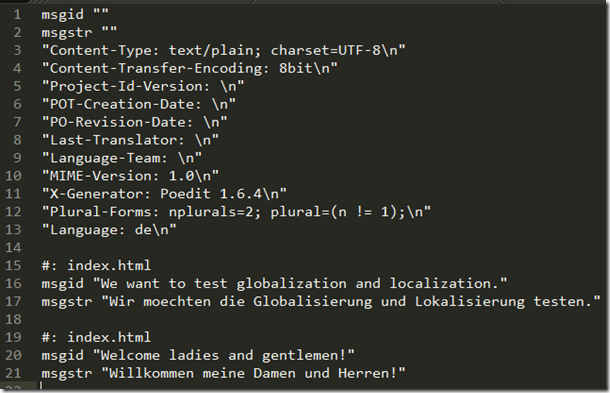 http://www.novanet.no/blog/hallstein-brotan/dates/2013/10/creating-multilingual-support-using-angularjs/</ul> I am sure there exist other implementations out there but for our purposes the first approach which is based on the Gettext format is the favorite one due to the fact that we do not have to use keywords as placeholders for texts but can just use plain English texts in code, and the rich ecosystem around it. 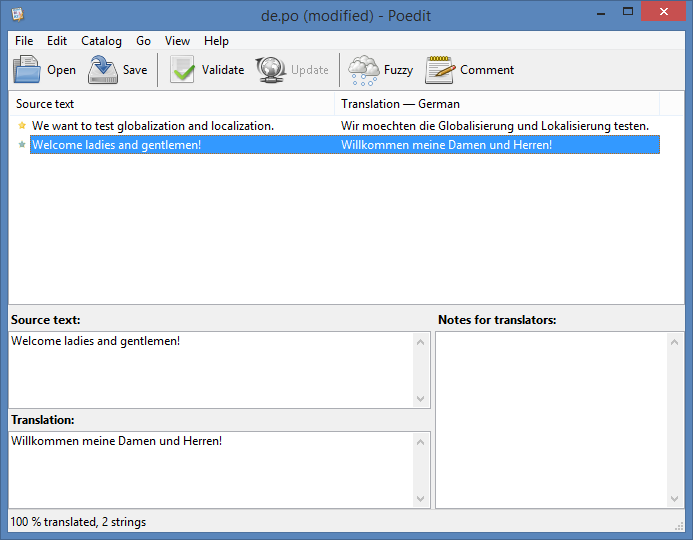 Specifically of interest is the Potedit application which provides a very user friendly way of translating texts. Since this time we need a couple of more libraries than just AngularJS we will use Bower to install all our dependencies. Bower is a package management system for the client similar to the nodeJS package manager npm which is used to manage server side packages. If you do not have node installed then please do it now from here. This will install Bower globally such as that it is available in any directory of the system. Now we create a new folder for our sample app. In my case I will call it c:\samples\translation. In your console navigate to this directory. Now open index.html in your favorite browser. The result is very unspectacular yet expected. We will just see two paragraphs with the texts as entered above. 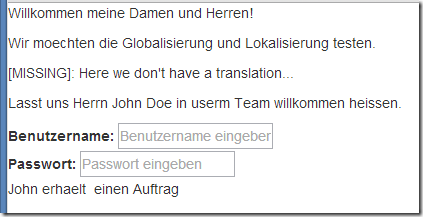 To enable translation support we have to add the directive translate to the two paragraph tags. On line 3 we ask the Angular injector service to provide us the gettextCatalog service defined in the angular-gettext library. 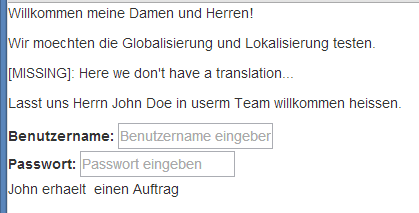 Then on line 4 we use this service and declare that we want to use the language German (code ‘de’) as the current language. On line 5 we declare that we want the service to help us to easily spot missing translations by marking the (original) text with a [Missing] prefix. After adding this code snippet save and refresh the browser. Nothing changed so far and the text is still in English as we have added it in code. On line 5 we define the task name we want to configure or initialize. On line 8 we declare that we want the task to parse all html files in the current directory or any sub directory of it and output the result of the task into a file called template.pot residing in the sub folder po of the current directory. We can see on line 7 and 11 that the two texts to translate have been correctly identified and extracted. This file will be used as input by one of the many editors available that are able to handle the gettext format. 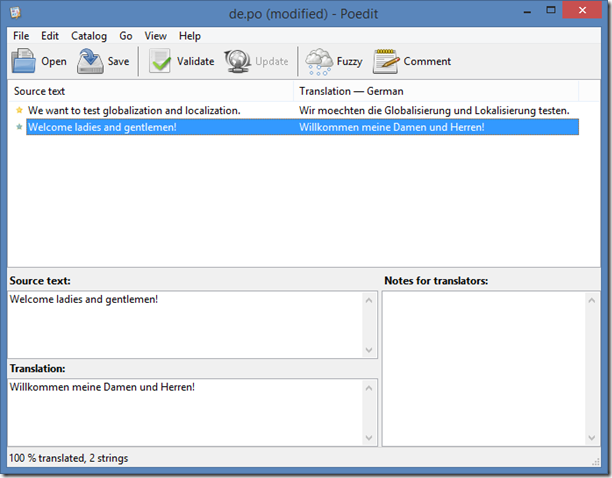 In this sample we will use the (free) Poedit application. Please head to this site and download and install the application on your system. Now this although human readable is not the format we need in our Angular application. But no worries, we have another task provided by the grunt-angular-gettext module called nggettext_compile which will compile the output of the Poedit application into a format that we can consume in our Angular application. Let’s configure this task in the Grunt file. Add the following snippet right after the first task configuration and save the file. On line 12 we define the task we want to configure and on line 15 we declare that we want this task to load all po files in the subfolder po of the current directory and compile them into a resulting file translations.js located in the current directory. 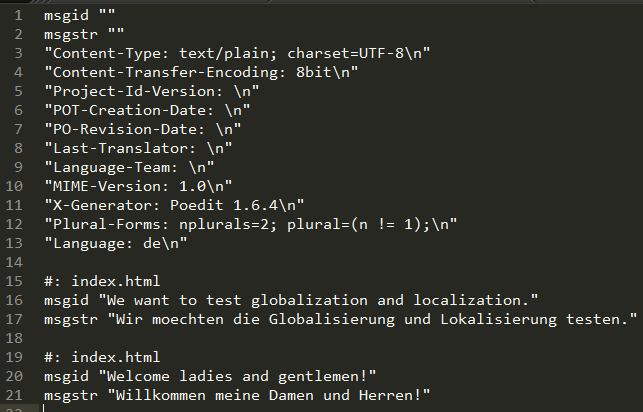 Opening the translations.js file in our text editor we get a (halfway minified) version of a new Angular module called gettext which contains the configuration of the gettextCatalog service with the various translations provided (in our case its only German so far). Back in our index.html we have to include the above file. And as a last step in the app.js file we have to declare that our app module depends on the gettext module. Go back to your browser and refresh the page. Hurray our text has been translated! 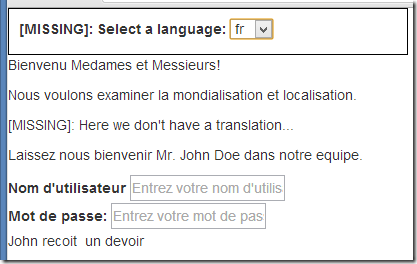 The application gives us a hint by prefixing the text whose translation could not be found with [MISSING]. This is very helpful, QA can easily spot missing translations. We can even write an end-to-end test (by using protractor) to find missing translations. Please note how the expression is written using inner (single) quotes to delimit the text to be translated and outer (double) quotes do delimit the value of the placeholder attribute which is an expression. In the above case the filter translate is applied to the text Enter your username. We directly write the singular (one task) in the </font> and use the two directives **translate-n** and **translate-plural** to define which is the counter/number and which is the plural form when using the counter/number. Can we change the language during run-time? Yes we can and it is very easy. 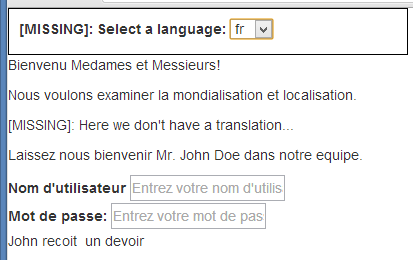 Let’s first create another translation, say French using Poedit. In order to make this function work we have to inject the gettextCatalog service into our controller.